The European Commission (formally the Commission of the European Communities) is the executive branch of the European Union. It operates in the method of cabinet government, with 27 "Commissioners," one for each country of the EU, led by a Commission President (currently José Manuel Barroso). The present Commission, known after its President as the "Barroso Commission" took office in late 2004 and is serving a five-year term. The body is responsible for proposing legislation, implementing decisions, upholding the Union's treaties and the general day-to-day running of the Union. The term "Commission" can mean either the college of Commissioners, or the larger institution; including the administrative body of about 25,000 European civil servants, who are divided into departments called Directorates-General. It is primarily based in the Berlaymont building of Brussels and its internal working languages are English, French and German. Originating in 1951 as the High Authority, the Commission has undergone numerous changes in power and composition under eleven Presidents. The first Commission originated in 1951 as the nine-member "High Authority" under President Robert Schuman. The Authority was the supranational administrative executive of the new European Coal and Steel Community (ECSC). In 1958 the Treaties of Rome established two new communities along side the ECSC: the European Economic Community (EEC) and the European Atomic Energy Community (Euratom). However the executives were called "Commissions" rather than "High Authorities". The reason for the change in name was the new relationship between the executive and the Council. Some states such as France expressed reservations over the power of the High Authority, wishing to limit its power, giving more power to the Council rather than the new executives. Walter Hallstein led the first Commission of the EEC and achieved agreement on a contentious cereal price accord in the wake of Charles de Gaulle's veto of British membership as well as making a positive impression upon third countries when the Commission made its international debut at the Kennedy Round. However, in 1965 the Hallstein Commission triggered the "empty chair" crisis with controversial proposals for the Common Agricultural Policy. Although the institutional crisis was solved the following year, it cost Hallstein the presidency despite otherwise being viewed as the most 'dynamic' leader until Jacques Delors. The three bodies co-existed until July 1, 1967 when, by means of the Merger Treaty, they were combined into a single administration under President Jean Rey. Due to the merger the Rey Commission saw a temporary increase to fourteen members, although all future Commissions were reduced back down to nine following the formula of one member for small states and two for larger states. The Rey Commission completed the Community's customs union in 1968 and campaigned for a more powerful, elected, European Parliament.Despite Rey being the first President of the combined communities, Hallstein is seen as the first President of the modern Commission. The Malfatti and Mansholt Commissions followed with work on monetary co-operation and the first enlargement to the north in 1973. With that enlargement the Commission's membership increased to thirteen under the Ortoli Commission (the United Kingdom as a large member was granted two Commissioners), which dealt with the enlarged community during economic and international instability at that time. The external representation of the Community took a step forward when President Roy Jenkins became the first President to attend a G8 summit on behalf of the Community. Following the Jenkins Commission, Gaston Thorn's Commission oversaw the Community's enlargement to the south, in addition to beginning work on the Single European Act. One of the most successful Commissions was that headed by Jacques Delors (the Delors Commission), with later Presidents failing to meet the same success. Delors was credited with giving the Community a sense of direction and dynamism. Delors and his team are also considered as the "founding fathers of the euro". The International Herald Tribune noted the work of Delors at the end of his second term in 1992: "Mr. Delors rescued the European Community from the doldrums. He arrived when Europessimism was at its worst. Although he was a little-known former French finance minister, he breathed life and hope into the EC and into the dispirited Brussels Commission. In his first term, from 1985 to 1988, he rallied Europe to the call of the single market, and when appointed to a second term he began urging Europeans toward the far more ambitious goals of economic, monetary and political union." The successor to Delors was Jacques Santer. However the entire Santer Commission was forced to resign in 1999 by the Parliament following allegations of fraud. That was the first time Commission had been forced to resigned en mass and represented a shift towards the Parliament. However the Santer Commission did carry out work on the Amsterdam Treaty and the euro. Following Santer Romano Prodi took office. The Amsterdam Treaty had increased the Commission's powers and Prodi was dubbed by the press as something akin to a Prime Minister. Powers were strengthen again with the Nice Treaty in 2001, giving the President more power over the composition of their Commission. In 2004 José Manuel Barroso became President, however the Parliament once again asserted itself in objecting to the proposed membership of the Barroso Commission. Due to the opposition Barroso was forced to reshuffle his team before taking office. The Barroso Commission was also the first full Commission since the enlargement in 2004 to 25 members and hence the number of Commissioners at the end of the Prodi Commission had reached 30. As a result of the increase in states, the Amsterdam Treaty triggered a reduction in Commissioners to one Commissioner per state, rather than two for the larger states. The Commission was set up from the start to act as an independent supranational authority separate from governments, it has been described as "the only body paid to think European." The members are proposed by their state governments, one from each, however they are bound to act independently – neutral from other influences such as those governments which appointed them. This is in contrast to the Council, which represents governments, and the Parliament, which represents citizens. Executive power of the Union is held by the Council, it confers on the Commission such powers for it to exercise. However the Council may withdraw these powers, exercising them directly, or impose conditions on their use. Powers are outlined in Articles 211–219 of the EC treaty and are more restricted than most national executives, in part due to the Commission's lack of power over areas like foreign policy – that power is held by the European Council, which some analyses have described as another executive. Considering that under the Lisbon Treaty the European Council would become a formal institution with the power of appointing the Commission, it could be said that the two bodies hold the executive power of the Union (the European Council also holds individual national executive powers). However, it is the Commission which currently holds executive powers over the European Community. The governmental powers of the Commission have been such that some such as former Belgian Prime Minister Guy Verhofstadt have suggested changing its name to the "European Government," calling the present name of commission: "ridiculous". The Commission differs from the other institutions in that it alone has legislative initiative over the European Community, meaning only the Commission can make formal proposals for legislation – bills cannot originate in the legislative branch. It shares this right with the Council over the CFSP pillar, and has no right over Police and Judicial Co-operation in Criminal Matters. In the Community however, Council and Parliament are able to request legislation; in most cases the Commission initiates the basis of these proposals, this monopoly is designed to ensure coordinated and coherent drafting of Union law. This monopoly has been challenged by some who claim the Parliament should also have the right, with most national parliaments holding the right in some respects. Under the Lisbon Treaty, EU citizens would also be able to request the Commission to legislate in an area via a petition carrying one million signatures, but it would not be binding. The Commission's powers in proposing law have usually centered on economic regulation. It has put forward a large number of regulations and they are based on a "precautionary principle." This means that pre-emptive regulation takes place if there is a credible hazard to the environment or human health: for example on tackling climate change and restricting genetically modified organisms. This is opposed to weighting regulations on the effect on the economy. Thus, the Commission have produced stricter a larger number of regulations that other countries, due to the size of the European market this has meant many regulators of the global market. However recently the Commission has moved into creating European criminal law. In 2006, an toxic waste spill off the coast of Côte d'Ivoire, from a European ship, prompted the Commission to look into legislation against toxic waste. Some EU states at that time did not even have a crime against shipping toxic waste leading to the Commissioners Franco Frattini and Stavros Dimas to put forward the idea of "ecological crimes." Their right to propose criminal law was challenged in the European Court of Justice but upheld. However as of 2007 the only other criminal law proposals have been on the intellectual property rights directive. Once legislation is passed, it is the Commission's responsibility to ensure it is implemented. It does this through the member states or through its agencies. In adopting the necessary technical measures, the Commission is assisted by committees made up of representatives of member states (a process known in jargon as "comitology"). Furthermore, the Commission is responsible for the implementation of the EU budget; ensuring, along with the Court of Auditors, that EU funds are correctly spent. In particular the Commission has a duty to ensure the treaties and law are upheld, potentially by taking member states or other institutions to the Court of Justice in a dispute. In this role it is known informally as the "guardian of the treaties." Finally, the Commission provides some external representation for the Union, along side the member states and the Common Foreign and Security Policy, representing the Union in bodies such as the World Trade Organization. It is also usual for the President to attend meetings of the G8. The President of the Commission is first nominated by the European Council; that nominee is then officially elected by the European Parliament. The candidate selected by the Council has often been, but is not by definition, a leading national politician. In 2004, the proposed Constitution had included a provision that the choice of President must take into account the latest Parliamentary elections. That provision was not in force in the nomination in 2004, but the center-right parties of the EU pressured for a candidate from their own ranks. 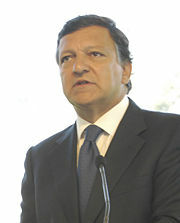 In the end, a right-wing candidate was chosen: José Manuel Barroso of the European People's Party. There are further criteria influencing the choice of the Council, these include: the area of Europe from which the candidate originates, favored as Southern Europe in 2004; the candidate's political influence, credible yet not overpowering members; language, proficiency in French considered necessary by France; and degree of integration, their state being a member of both the eurozone and the Schengen Agreement. In 2004, this system produced a number of candidates and was thus criticized by some MEPs: following the drawn-out selection, the ALDE group leader described the procedure as a "Justus Lipsius carpet market" producing only the "lowest common denominator"; while Green-EFA co-leader Daniel Cohn-Bendit asked Barroso after his first speech "If you are the best candidate, why were you not the first?" Following their appointment, the President appoints a number of Vice-Presidents among the Commissioners. At present there are five, with Margot Wallström as the current "First" Vice President. For the most part, the position grants little extra power to Vice-Presidents, except the first Vice-President who stands in for the President when he is away. The Commission is composed of a 27-member college of "Commissioners," this is including the President and vice-presidents. Even though each member is appointed by a national government, one per state, they do not represent their state in the Commission. Once proposed, the President has responsibility to delegate portfolios among all of the members. The power of Commission largely depends upon their portfolio. For example, while the Culture Commissioner isn't a very important figure, the Competition Commissioner is a powerful position with global reach. Before they can taken office, the college as a whole must be approved by the Parliament. The present Commission, the Barroso Commission, took office in late 2004 after being delayed by objections from the Parliament which forced a reshuffle. In 2007 the Commission increased from 25 to 27 members with the accession of Romania and Bulgaria who each appointed their own Commissioners. With the increasing size of the Commission, President Barroso has adopted a more Presidential style of control over the college, which has earned him some criticism. Furthermore, there has also been a greater degree of politicization within the Commission, being welcomed by Commissioner Wallström as necessary for citizens' engagement in European affairs. The Commission is primarily based in Brussels, with the President's office and the Commission's meeting room on the 13th floor of the Berlaymont building. 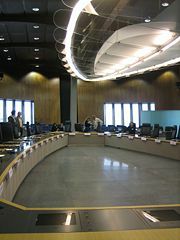 The Commission also operates out of numerous other buildings in Brussels and Luxembourg. The Commission is divided into departments known as Directorates-General (DGs) that can be likened to departments or ministries. Each covers a specific policy area or service such as External relations or Translation and is headed by Director-General who is responsible to a Commissioner. A Commissioner's portfolio can be supported by numerous DGs, they prepare proposals for them and if approved by a majority of Commissioners it goes forward to Parliament and Council for consideration. There has been criticism from a number of people that the highly fragmented DG structure wastes a considerable about of time in turf wars as the different departments and Commissioners compete with each other. Furthermore the DGs can exercise considerable control over a Commissioner with the Commissioner having little time to learn to assert control over their staff. According to figures published by the Commission, 23,043 persons were employed by the Commission as officials and temporary agents in April 2007. In addition to these, 9019 "external staff" (e.g. Contractual agents, detached national experts, young experts etc) were employed. The single largest DG is the Directorate-General for Translation, with a 2186-strong staff, while the largest group by nationality is Belgian (21.4 percent), probably due to a majority (16,626) of staff being based in the country. The Commission's civil service is headed by a Secretary General, currently Catherine Day. Communication with the press is handled by the Directorate-General Communication. The Commission's chief spokesperson is Johannes Laitenberger who takes the midday press briefings, commonly known as the "Midday Presser." It takes place every weekday in the Commission's press room at the Berlaymont where journalists may ask questions of Commission officials on any topic and legitimately expect to get an "on the record" answer for live TV. Such a situation is unique in the world. There is a greater number of press corps in Brussels than Washington D.C.; media outlets in every Union member-state have a Brussels correspondent. It has been noted by one researcher that the press releases issued by the Commission are uniquely political. A release often goes through several stages of drafting which emphasizes the role of the Commission and is used "for justifying the EU and the commission" increasing their length and complexity. Where there are multiple departments involved a press release can also be a source of competition between areas of the Commission and Commissioner's themselves. This also leads to an unusually high number of press releases, 1907 for 2006, and is seen as a unique product of the EU's political set-up." It is argued by some that the method of appointment for the Commission increases the democratic deficit in the European Union. While the Commission is the executive branch, the candidates are chosen primarily by the 27 national governments, meaning it is hard for the Commission to be thrown out directly by the voters. The legitimacy of the Commission is mainly drawn from the vote of approval that is required from the Parliament along with Parliament's power to sack the body, however there has been less than 50 percent turnout in the Parliament's elections since 1999. While higher than some national elections, including the US Congress, the fact that there are no direct elections to the Commission President like in the US makes the post less legitimate in the eyes of the public. A further problem is the lack of a coherent electorate, even though democratic structures and methods are developing there is not such a mirror in creating a European civil society. The new Lisbon Treaty could go some way to resolving the deficit in creating greater democratic controls on the Commission, including enshrining the procedure of linking elections to the selection of the Commission president. Under the plans of Vice President Wallström, European political parties would gain greater prominence and could lead to the Commission President being elected via the Parliament's elections. The alternative viewpoint on the Commission is that the policy areas in which it has power to initiate legislation are ill-suited to an institution accountable to electoral pressures. In this respect the Commission has been compared with institutions such as independent Central Banks, which deal with technical areas of policy that are of little electoral salience. In addition some defenders of the Commission point out that legislation must be approved by the Council in all areas (the ministers of member states) and the European Parliament in some areas before it can be adopted, thus the amount of legislation which is adopted in any one country without the approval of its government is limited. The proposed Lisbon Treaty, the details of which were agreed in June 2007, largely retains the reforms outlined in the rejected Constitutional Treaty. The constitution's reforms proposed a number of changes, notably the number of Commissioners would be reduced; from 2014 only two out of three member-states would have the right to representation. The representation would be rotated equally between all states and no state would have more than two in any single Commission. The Commission would also include the new High Representative of the Union for Foreign Affairs and Security Policy, as one of the Vice Presidents, replacing the External Relations Commissioner. The High Representative would have been called the "Union Foreign Minister" – the first time a member of the Commission held the common national title of "Minister." In the appointment of the Commission, the most recent European elections would have to be taken into account. It is thought this would create a stronger link between the elections and the Commission, however the President would still be proposed by the Council. Although when the Parliament votes on the Commission, the treaty changes the term "approve" to "elect" in referring to the vote: it is unknown yet if this will produce practical change. Duina, Francesco G. The Social Construction of Free Trade: The European Union, NAFTA, and MERCOSUR. Princeton, NJ: Princeton University Press, 2006. ISBN 9780691123530. Merritt, Giles, OPINION: A Bit More Delors Could Revamp the Commission. International Herald Tribune, 1992-01-21, . accessdate 2007-10-17. Smith, Norris. The European Union. Bronx, NY: H.W. Wilson Co., 2005. ISBN 9780824210465. Stafford, James. The European Union: Facts & Figures. Philadelphia: Mason Crest Publishers, 2006. ISBN 9781422200384. This page was last modified on 10 August 2017, at 18:36.